Whenever we view the moon through a telescope on my star tours, people can't help but be impressed by the rugged, cratered lunar surface. This often leads to questions about whether the moon continues to be struck today. It does, but much less frequently and by much smaller objects than made the great craters we see on the surface now. 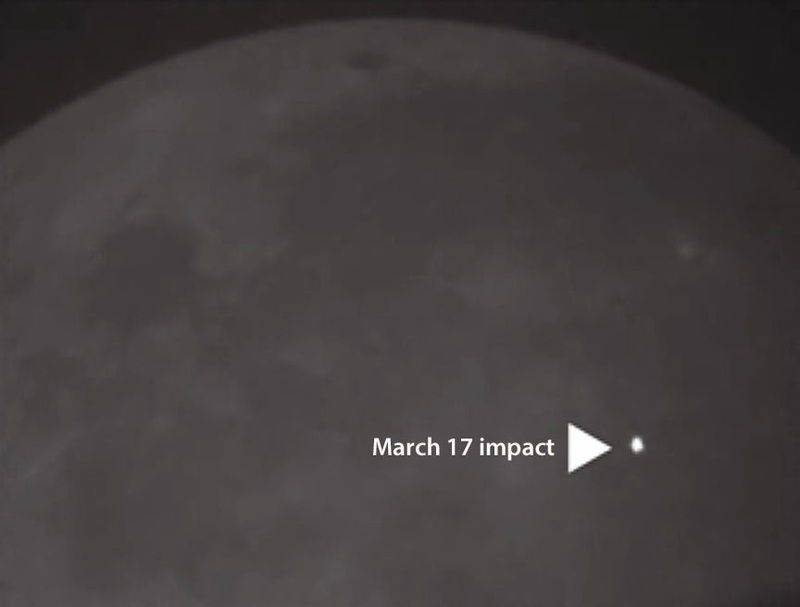 NASA's Lunar Impact Monitoring Program recorded its brightest meteoroid impact in 8 years of operation on March 17 of this year when it photographed a 4th magnitude flash of light in Mare Imbrium, not far from the great crater Copernicus. This flash of light was later discovered to have been made by a meteoroid 1.5 feet long, travelling at a speed of 56,000 mph, striking the lunar surface with a force of 5 tons of TNT. Scientists predicted it could have caused a crater up to 65 feet (20 meters) in diameter. Bright flash of light recorded on March 17 of meteoroid striking the lunar surface in Mare Imbrium (Sea of Rains). When the Lunar Reconnaissance Orbiter passed over it took pictures of the region and recorded a brand new crater 59 feet in diameter with splashes of fresh lunar ejecta surrounding it. The LRO orbits the moon at a distance of 31 miles. From our location on earth, an average of 235,000 miles from the moon, the new crater would not be visible in even the largest telescopes. Location (on left) and photo (on right) of the March 17 impact that created the new 59 foot diameter lunar crater. Over time (hundreds of millions of years) the lunar ejecta will turn darker and redder as a result of "weathering" caused by micrometeorite bombardment, cosmic rays, and solar radiation. This ejecta field resembles the bight ejecta and lunar rays that surround some of the moons most prominent craters, like Tycho, Copernicus, and Aristarcus. We can only imagine how stunning those craters must have looked millions of years ago when they were still young and fresh. Animated image of before and after regions on the moon where the new March 17, St. Patty's Day Crater was formed. Since 2005 the Lunar Impact Monitoring Program has recorded over 300 flashes of light, which are presumed to have been made by meteoroids striking the moon and making small craters.